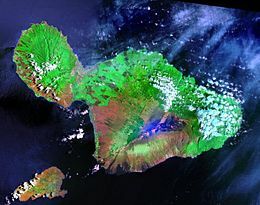 Laundsat satellite image of Maui. The smaa island tae the soothwast is Kahoʻolawe. The island o Maui (/ˈmaʊ.iː/; Hawaiian: [ˈmɐwwi]) is the seicont-lairgest o the Hawaiian Islands at 727.2 square miles (1,883 km2) an is the 17t lairgest island in the Unitit States. ↑ Kinney, Ruby Kawena (1956). "A Non-purist View of Morphomorphemic Variations in Hawaiian Speech". Journal of the Polynesian Society. 65 (3): 282–286. This page wis last eeditit on 31 Januar 2016, at 00:59.